The manufacturing capacity of the new Rolls-Royce facility in Rotherham is set to double to 200,000 turbine blades per year once the ground-breaking manufacturing techniques have been validated. The Advanced Blade Casting Facility (ABCF) is currently being kitted out at the Advanced Manufacturing Park (AMP) in Rotherham. The multi million pound facility will produce a specific portfolio of civil aerospace parts, such as turbine blades, using advanced manufacturing techniques and an increased level of automation. The new foundry will be used for Rolls-Royce's pioneering work in the manufacture of single crystal (SX) turbine blades. George Durrant, the technical lead for Rolls-Royce at the ABCF, discussed the new, high-productivity manufacturing processes that will create these important and highly complex aero engine components at a recent meeting of the Institution of Mechanical Engineers (IMechE) in Sheffield. The Rotherham factory will manufacture advanced turbine blade castings for the company's most modern, high-thrust engines. There are over 65 in every iconic Trent engine. The turbine extracts energy from the hot gas stream received from the combustor in high-thrust aero engines. Turbine blades convert the energy stored within the gas into kinetic energy. It is required to withstand centrifugal loads of up to ten tonnes while operating at temperatures in excess of the melting point of the alloy. One HP blade lasts five million flying miles before being replaced. Durrant explained how making a blade as a single crystal using a modified version of the directional solidification technique eliminates grain boundaries, a source of weakness in a high stress application, and single crystal casting, exotic alloying additions and protective coatings have enabled Rolls-Royce to increase metal temperatures by approximately 300°C over the last 50 years, a figure that can be doubled when the temperature of the gas stream itself is considered. Speaking at the event, Durrant said: "Rolls-Royce has a £71 billion order book, with around £60 billion coming from our civil aerospace division. Our Airbus XWB program is a FTSE size business on its own. "Fuel consumption is now the biggest driver of engine design. If you can increase the heat in the turbine, you can increase the efficiency, and we are working on new components that can operate at increasing pressure ratios and increasing temperatures. The SX blades are crucial and lowering the cost of their production is the challenge." Rolls-Royce chose to invest in a new facility as it needed more than one location for the production of its HP and IP turbine blades. It selected Rotherham due to the AMP and the close links already forged with the University of Sheffield Advanced Manufacturing Research Centre (AMRC) with Boeing on the site. It was also a condition of the government funded research that a location with a legacy of heavy industry was selected, creating 180 jobs in the area. 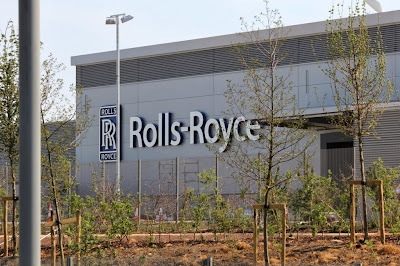 Rolls-Royce has been working closely with the Manufacturing Technology Centre (MTC) in Coventry (part of the government's High Value Manufacturing Catapult Centre along with the AMRC in Rotherham) to develop and optimise the enabling technologies. All though reluctant to disclose the precise details, Durrant explained that the improvements include more automation and control with robots used in the casting process and the factory operating more like a modern automotive factory, with greater integration and intelligence. With blades manufactured to tolerances of +/- 0.2mm, and from advanced alloys, measurement techniques at the ABCF are at the cutting edge. 3D structured light systems and computer tomography is being used to see inside the cast pieces to check that they are fit to fly. As well as adding capacity and capability, the new ABCF is set address cost issues and vastly increase the yield of the casting process. Currently, for every 100 casts going through the process, one fifth can't be sold and are recycled. This is the magic number for high end manufacturers who are using alloys that are more expensive than silver. Durrant added: "The new techniques are about not letting manufacturing limit design. The development of new alloys is slowing down and we recognised four years ago that SX is crucial to the aerospace industry." Equipment is in place at the ABCF but only half of the 14,900 sq m factory is currently in use. Validation is taking place and parts will begin to be shipped this year. With an initial capacity of 100,000 blades per year, this is set to increase to 200,000 in 2016. "The manufacturing process needs proving," concludes Durrant, "but it will happen."